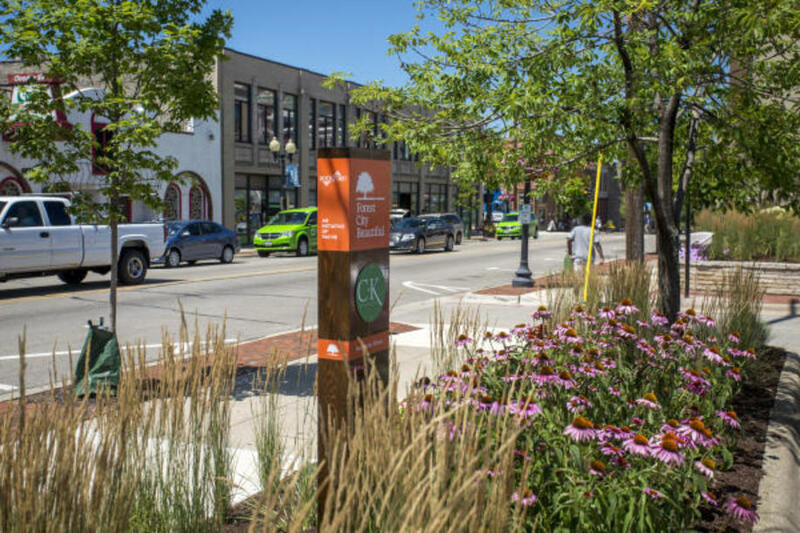 With a vision of creating a downtown for residents and visitors to enjoy, Forest City Beautiful began in 2014 by the Rockford Area Convention and Visitors Bureau. During its short existence, it has been steadfast in bringing a tremendous positive impact to our region. A few of its many projects include the incredible planters lining State Street that change with the beauty of each season, the benches and bistro tables that invite citizens and visitors alike to enjoy a delicious coffee from a local coffeehouse or a casual meal from one of our amazing restaurants, and sculptures and murals that boast we are a community with a zest for life. 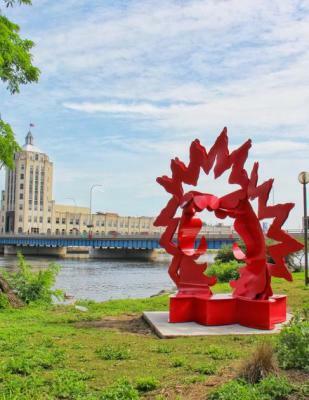 During the summer of 2018 alone, Forest City Beautiful has brought us the Rockford Sculpture Walk Biennial that features thirteen new art sculptures located throughout the downtown area and a personalized mural by internationally recognized artist, Kelsey Montague. 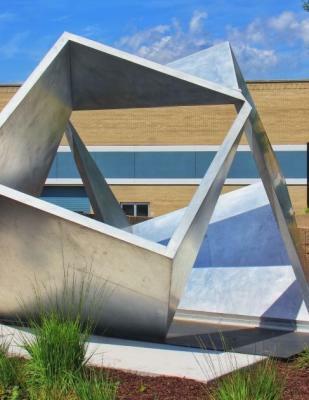 The locations of the sculptures can be found at: gorockford.com/publicart. 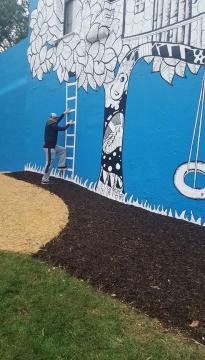 The Kelsey Montague mural is at the southwest corner of E. State Street and 1st Street. The vibrancy created by these two initiatives encourages young and old alike to embrace the moment, have fun, and get outside and enjoy your city. 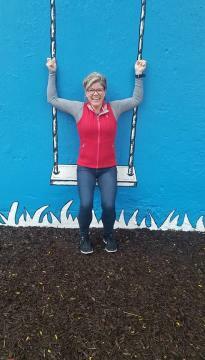 In this spirit, our recent downtown adventure began at the Kelsey Montague mural where I let the inner-kid in me come out as I put forth my best effort to mimic the playful Heels Over Head sculpture created by Paul Bobrowitz, adjacent to the mural. 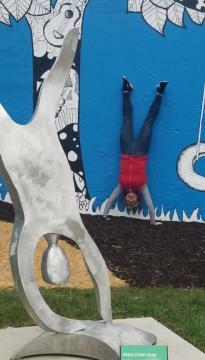 If the sculpture doesn’t move you in that way, have fun with the mural which is designed to be interactive. The space promotes playfulness, so if you are really feeling inspired, try to incorporate both works into your photos and fun! One of the best compliments to the individuals behind these initiatives is to show your appreciation of them. Venture out, see these and many other wonderful sights throughout the city, and share your pictures on social media using #gorockford. We did, and had a great time doing it! If you would like to do more, the annual Forest City Beautiful fundraiser, Paint the Town Green, is right around the corner on October 12th. This year it will further embrace the spirit of having fun with a vintage circus theme. A great time for sure. For more information, visit: https://www.gorockford.com/events/green/, or https://www.gorockford.com/about/forest-city-beautiful/ for more information on Forest City Beautiful.